Dutch oven roast lamb - Here's how you do it! It's super easy! When we go camping, we absolutely love cooking a roast in our dutch oven. We have a few Dutch ovens, a larger one for when we are cooking for a crowd and a smaller one when it’s just us. 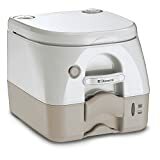 When we are on a quick weekend trip, we also usually do a bit of preparation at home first, just to make it easier on us when we are camping. It also makes it more relaxing too. This is our preparation for a roast lamb. We marinate the lamb overnight with rosemary and garlic and a little salt and pepper. We just put it in a zip-lock bag as it’s great for being able to regularly roll the lamb around in the marinade and it’s easy to put in the fridge as well. We cut up all the vegetables as well and will often pre-make the gravy and just add the fresh juices from the Dutch oven into the pot. Late in the afternoon, we start the fire up. This fire shows that you don’t need anything huge. All you need are some hot coals. We always use a trivet underneath our meat as it stops it sticking to the base of the Dutch oven. Lightly oil the trivet first. We cook the lamb for a little while before removing the rosemary, just so the flavour doesn’t get too strong. Once the lamb is in the Dutch oven, put it on the coals. Be very watchful of it as it will cook very quickly. Once the lamb has started to cook, we add the vegetables. These cook even faster on such a high heat. In the meantime, we heat the gravy on a gas stove that we use separately. Depending on the size of your meat, the cooking process can take around 40 minutes. Soon you’ll have crispy potatoes, soft root vegetables and a delicious piece of lamb to enjoy. All you need now is a good glass of wine to go with it. Enjoy! 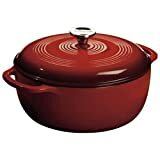 Click on the image link below to look at this fancy red Dutch oven or others available on Amazon.